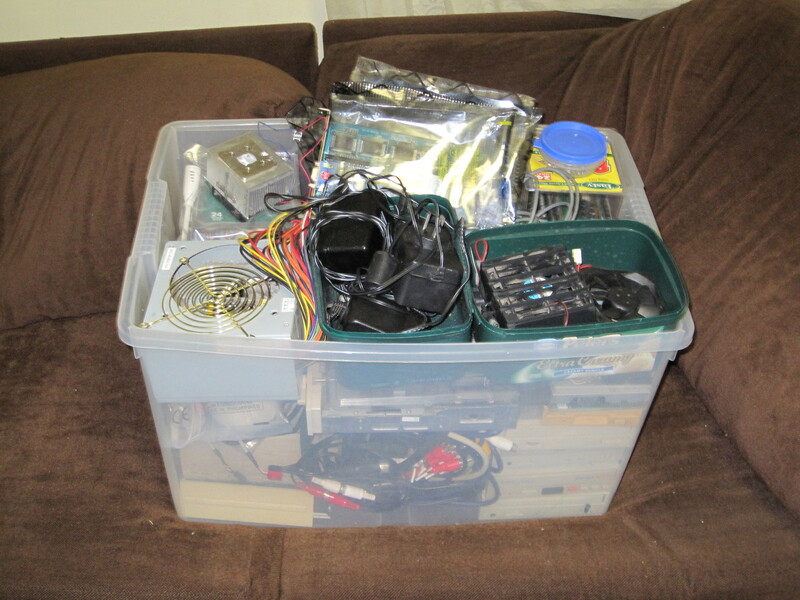 Last time I went to see my family out in the bush I had a look at some of the hardware I had in storage there. I found I had a NEC FD1157C 5.25″ floppy disk drive made in 1989 that had come from an Epson machine one of my uncles had given my father. The drive, whilst badly yellowed looked like it was in good shape mechanically, but upon testing with hardware I had on hand at my parents place it didn’t work. It didn’t even seem to seek properly. This drive has a number of jumpers on the main circuit board, so I checked online to find out the settings. After trying for a while I still couldn’t get it to work. I decided I’d bring it back with me to try to work out what was wrong. I have better diagnostic equipment here. Having been doing other things I hadn’t had a chance to look at it until just this weekend gone. I rechecked the mechanism to see that it moved freely. This type of head travel mechanism is nice in the sense that it doesn’t have a screw to lubricate, so it’s a bit cleaner, easier to adjust, and reliable. Fortunately it didn’t require service as the heads moved backwards and forwards freely. The spindle motor similarly was in good condition. It seemed likely a problem on the circuit board, perhaps a bad jumper setting. So I rigged the drive up in my MS-DOS machine and in the process of setting up the BIOS for testing the drive it performed the drive seek test and seemed to work. I was quite surprised by this as I couldn’t get it to do that at all at my folks place. I found the website with jumper settings for some NEC drives. 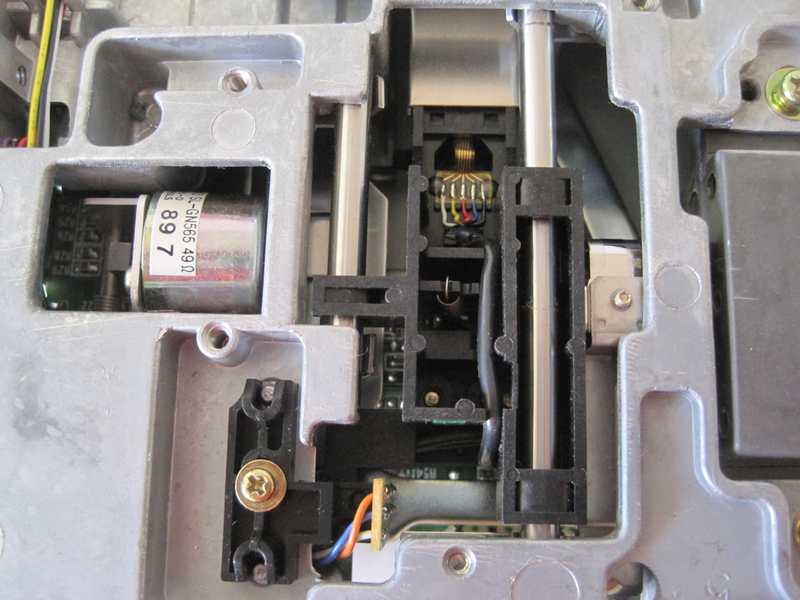 After setting the jumpers the drive appeared to work but the drive light didn’t ignite when the drive was in use. I tried a few things and found that the LM1 setting on the drive needs to be 1 rather than 0 for the light to work. I was a little disappointed to not get to use my oscilloscope to check the test points. I’ve done some minimal testing and everything appears fine, but I will test it against my reference working drive to make sure the alignment is right. I want to make sure it reads and writes to disks reliably without damaging them. I might even probe some of the test points just for fun! This drive is a good one to have as it appears more serviceable than others I have. Although I have to wonder why it didn’t work when I tested it at my folks place. Perhaps a bad cable? This weekend I was rather busy catching up on housework and replacing some parts on my motorbike after going on a short holiday. So I was unable to really find any time to play a game for writing about. I did however find some time to do a little bit of hardware tinkering with some new bit and pieces I’ve recently acquired. Firstly I recently bought myself a decent oscilloscope for the purposes of fixing old computer hardware and to help with hardware projects. I bought a Rigol 2000 series 70Mhz scope which was about 900 Australian Dollars (inc GST). So far I’ve found it pretty easy to use and have been able to probe points all over my poor ZX Spectrum which seems to have destroyed another video chip. Using it I have located a capacitor that looks like there is no voltage reaching it so the board may have power issues or that cap may be bad. In any case the scope I got seems quite good, and even though I only ever used an old school analog scope back at Uni I’ve found this one easy to do what I want with it. The second thing I brought back from a holiday to see my parents recently. It is the original 5 inch floppy drive from our old Twinhead 386sx computer we got when I was a kid. It is a Canon MD 5501 drive that unfortunately has seen better days, it originally had a problem when my well meaning Dad tried cleaning it. 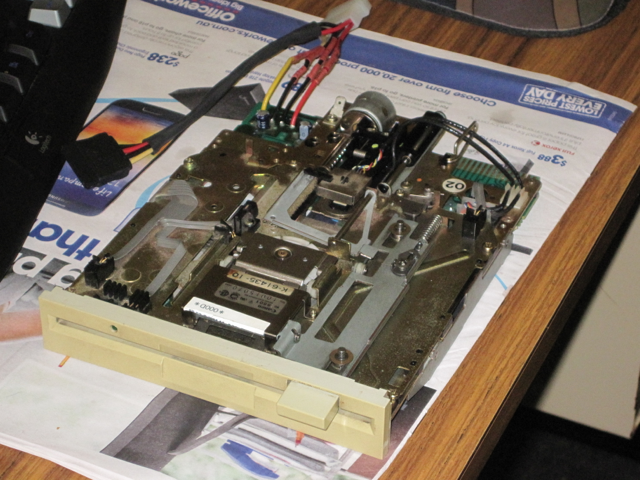 After he cleaned it reading disks became basically impossible, and the eject mechanism eventually began to stick. We thought the drive was dead, but it probably just needed proper lubrication and alignment after Dad messed with it. Not knowing this I removed the power connecter from it some years later for connecting up some fans I was wiring up for my then computer chassis. So the drive requires heaps of attention to try to restore it. But so far I’ve been quite successful in freeing up and lubricating the eject and head mechanism with some simple silicon spray. It now looks pretty good mechanically! I’ve soldered on a power connecter cannibalizing a Molex to dual SATA power converter. It’s not as tidy as the original connector but it seems to work. I have yet to work out how to go about re-aligning the heads but that is the next challenge! Because the original main board for our 386sx is still functional I am entertaining the thought of re-building our old machine. The main problem being I don’t have the original chassis as it got rusted when the external CMOS battery leaked. Fortunately the main board survived this, but being what it is, it doesn’t fit any chassis I have laying around. I guess that’s not an issue until I get to putting it in a pretty case!